The X-Ray specs, I never once believed; I was enchanted, to use Jeff Zeleney's word, by the idea, and had a normal boy's curiosity about little girls' underwear, but even as a very little kid I realized that x-ray spectacles would be impossible, and even if it were possible, it would not be an gizmo that could be had for a mere 98 cents. 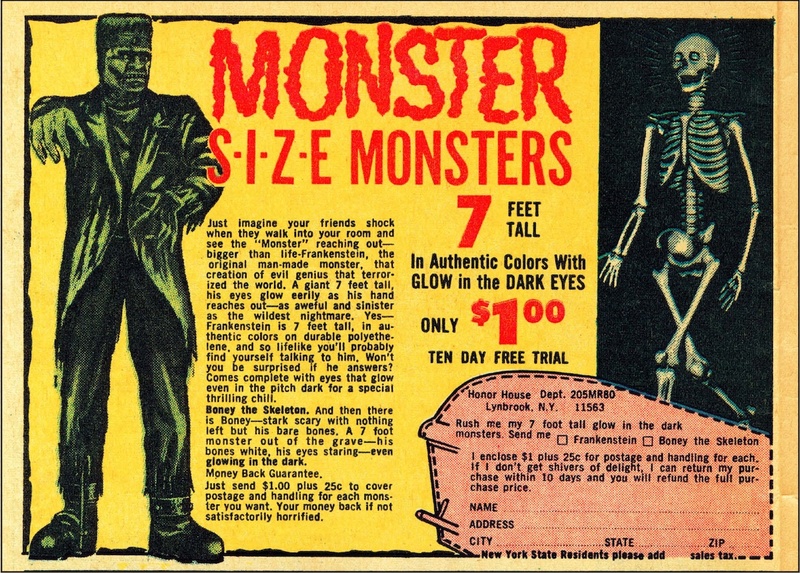 Something that mesmerized me -- because it seemed actually possible, though not at the given price -- was the claim of a 7-foot tall ghost that you could control and make float around per your commands and scare the living hell out of people. Now, I had an idea that that would indeed be possible -- I would dream of the radio control and the little lightweight directional fan that would hang beneath a helium balloon, like an airship's gondola, the whole thing draped in white cheesecloth perhaps stained with glow-in-the-dark ink to give it a spectral halo. And I dreamt, and dreamt, and dreamt of that ghost. But I sort of doubted I would get a helium tank, a radio control, and a fan propulsion system for the $1.49 or whatever they wanted for it. Also causing me to doubt this was the alleged Frankenstein's Monster they also offered, supposed with the same features. See, I could see how they could give you ghost -- a ghost could just be a helium balloon and some light gauzy fabric draped over it. That indeed could look like a ghost. But how could you do Frankenstein's Monster? It's solid. We're talking a lot more material for that. And Frankenstein's Monster doesn't float; he walks. So, for that to be real, they would have to send you a working, walking seven-foot tall robot with some kind of latex to mimic flesh. And that, I realized, would be impossible, and that in turn punctured my dreams about the radio-controlled ghost. If they were lying about Frankstenstein -- and they must be lying about that one -- they must also be lying about the ghost. But I used to lie in bed for long hours perseverating to myself, trying to convince myself, rationalize to myself that while the Frankenstein's Monster thing was a lie, the ghost thing could actually, plausibly be real. It's a weird feeling I have right now, having looked this up, the memories of those old muttering internal conversations with myself thinking of a Remote-Controlled Ghost, and how it could totally be possible, and wouldn't that be wonderful? And then would come the doubts: For 98 cents, Dummy? What are you, a Dum-Dum, Dummy? But they couldn't lie could they? Not to children, of all people. There are laws. And I did this a lot as a kid. I thought about that damned ghost a lot. All the people I'd scare, and all the friends I'd make with my amazing technological illusions. I really tried to convince myself this was a real thing. Well anyway, this guy collected most of those things advertised in comics, buying them decades later on eBay, and now, for the first time ever, I have the definitive word on that Remote Control Ghost. The other [disappointment, apart from the gadget that supposedly allowed you to throw your voice like a ventriloquist] is that U-Control Ghost. 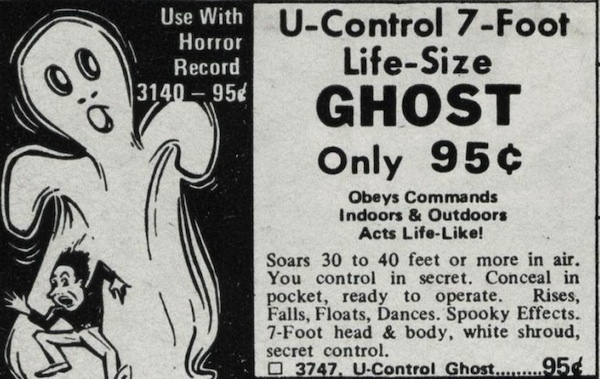 The ad says, "U-Control 7-foot life-size ghost. It obeys commands indoors and outdoors, acts life-like, soars 30 to 40 feet. You control in secret, conceal in your pocket, ready to operate, floats, dances, spooky effects, 7-foot head and body, white shroud, secret control." Well, it’' a balloon and a trash bag, basically, and some string. That would be the ultimate disappointment because that ad paints such an elaborate image in your mind, and even the picture shows a boy fleeing from this huge specter. I’m envisioning this remote control thing that's massive and scary, and then you find out it's just a balloon. 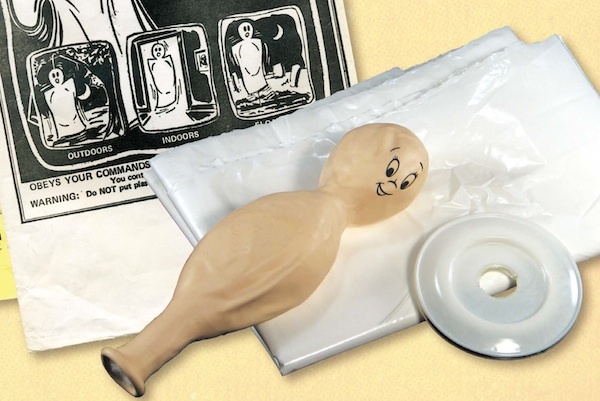 Well, what's horrible is one of the faces that was printed on the balloon is none other than Casper the Friendly Ghost. It's supposed to be this terrifying thing, and it's literally the friendliest ghost there is. Decades later, and the mystery that haunted me is finally solved. Check that guy's link to find out what you would have gotten if you bought those X-Ray Specs, or the Amazing Radio Spy Pen, or Sea-Monkeys building futuristic miniature subterranean civilizations, somehow, or Charles Atlas' Bodybuilding course, or... that army of 500 plastic soldiers you could have for a couple of bucks. Man, is that a disappointment too. Open Thread, but feel free to share what you really wanted as a kid, but never got -- or did get, and whether it was all that you hoped for. Soothsayer suggested that as a topic last Friday; without remembering that until just now, I just wrote a post on that theme. So it seems like a good subject for discussion.